FREEHOLD, NJ (WABC) -- The Monmouth County Society for the Prevention of Cruelty to Animals has charged a Howell Township couple with more than 550 counts of animal cruelty. Charlene and Joseph Handrik are charged with 276 counts of Animal Cruelty for inflicting unnecessary cruelty upon a living animal and 276 counts of animal cruelty for failing to provide proper and necessary veterinary care to their 276 dogs. After extensive discussions, it was decided to charge the Handriks with disorderly persons animal cruelty as opposed to indictable animal cruelty charges. "This decision was due in large part to the miraculous fact that despite living in deplorable conditions and not receiving proper veterinary care," Acting Monmouth County Prosecutor Christopher Gramiccioni said. "The dogs seized from the residence were in relatively good physical health." Additional charges are expected to be filed against the Handriks, including charges for not properly licensing and vaccinating their animals. The case is expected to be prosecuted in the Howell Township Municipal Court. MCSPCA was called in on Friday, June 3, responding to a call about a stray dog running around the neighborhood. That call prompted concern about the number of dogs inside the Handrik family's Bennett Road home. 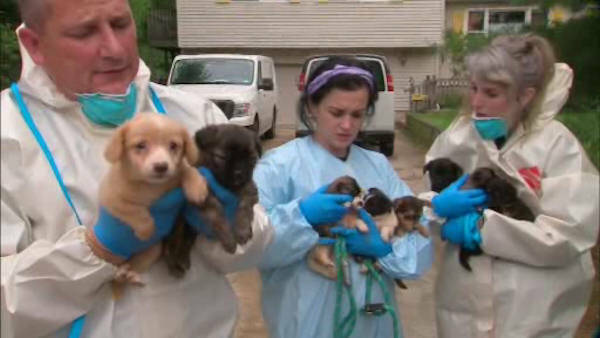 A number of local agencies responded to the scene, where 276 dogs were discovered living in deplorable conditions. The Handriks could face substantial fines and penalties if found guilty on all counts. The first dog being adopted, a 4-year-old French bulldog mix, went to a couple who volunteer at the SPCA.